She has been an ardent writer since years and her first poem Hide and Seek was published in an anthology titled Shout it Out, published by Lost Tower Publications, UK. Later, her poem Hidden was published by Poetry Breakfast, USA. It was December, 2015, when her dear friend coaxed her into getting published. Hence, she decided to get out of her privacy and share her writing with the world. 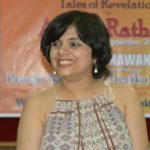 Her first book, a collection of poems titled Epiphany-tales of revelation came out in June, 2016 and is already successful with the readers. She is a trained Kathak dancer, actor, and loves stage. She loves conversation over coffee and American TV series.